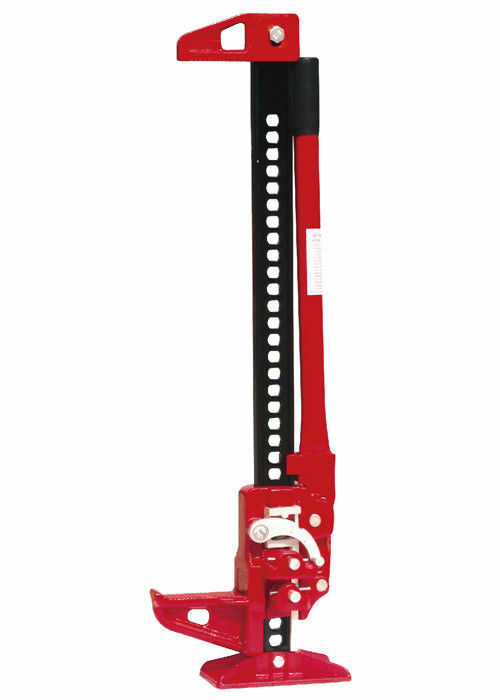 Commercial-quality jack will lift, pull, push and clamp. Hot-rolled alloy steel, powder-coated with zinc-pated hardware. 2-pc. handle and socket for extra durability and reliability. Base is heavily ribbed for strength. 1. Be sure base of jack is on firm and level ground. 2. Be sure your jack will not slip after load is applied. 3. Be sure lifting arm is fully under load applied. 4. Be sure the load is stabilized before lifting so that it will not shift when lifting or lowering. 5. Do not work under vehicle after lifting unless you have jack stands supporting the vehicle. 6. Do not push load off the jack;Lower it carefully. 7. Do not use handle extensions. 8. Do not carry jack by handle.